Nutrients applied in fertilisers or manures can cause problems if they are lost from the soil to water or to the air. For example nitrogen can be lost to water through leaching of nitrate, to the air through dentrification as nitrogen oxides or to the air through volatilisation of ammonia. Potassium (K) can be lost from the soil by leaching though amounts are small except on sandy soils. Average leaching losses, measured in terms of potash (K2O), of around 1.2 kg K2O/ha per 100 mm drainage have been reported for loams and clayey soils. In experiments in Denmark, leaching losses of 0.6 kg K2O/ha and 8.4 kg K2O/ha per 100 mm drainage were found for soils with 24% and 5% clay respectively. 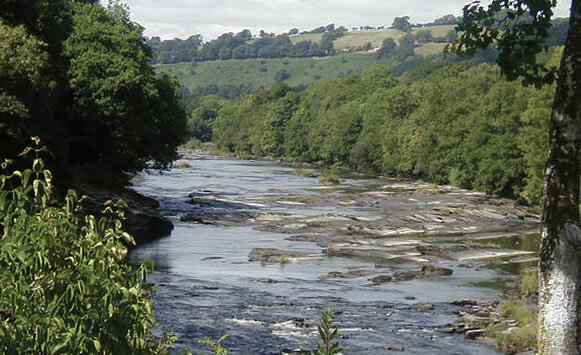 The concentration in water draining from agricultural land in the UK rarely exceeds 3 mg K/litre and that in rivers rarely approaches 10 mg K/litre. The EC Drinking Water Directive set a maximum admissible limit of 12 mg K/litre with a guideline of 10 mg K/litre. These limits do not appear to have any toxicological or other basis as they are vastly exceeded in many common drinks (e.g. 1570 mg K/kg in milk and fruit juices, 880 mg K/kg in coffee). Losses of potassium to water are not of environmental concern in the UK. Potassium is not lost to the air from soil. Deficiency of any nutrient can reduce crop yield and uptake of other nutrients. This is especially so for the relationship between potassium and nitrogen. A deficiency of potassium can affect nitrogen uptake and transport from roots to shoots, protein development and yield in a crop. Potassium is an activator for some forty enzymes, and is involved in the development of proteins from nitrate that has been taken up. Inadequate potassium leads to an accumulation of nitrate in the roots and this can restrict uptake of more nitrogen from the soil. There will be a consequent effect on the efficiency of utilisation of nitrogen applied in fertilisers or manures. Poor efficiency of nitrogen utilisation will lead to unnecessary nitrogen residues in the soil and to an increased risk of nitrate leaching. Because there are no environmental problems associated with potassium, potash application is not a specific issue for cross-compliance. General rules for fertiliser and manure use covering field boundaries and margins and set-aside areas must be complied with. 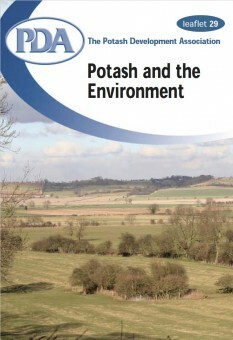 Records of potash applications in fertilisers and manures should be kept as these will be useful for future decisions on potash use. It is good practice for both environmental and economic reasons to ensure nutrient applications, including those of potash, match crop requirement as closely as possible. 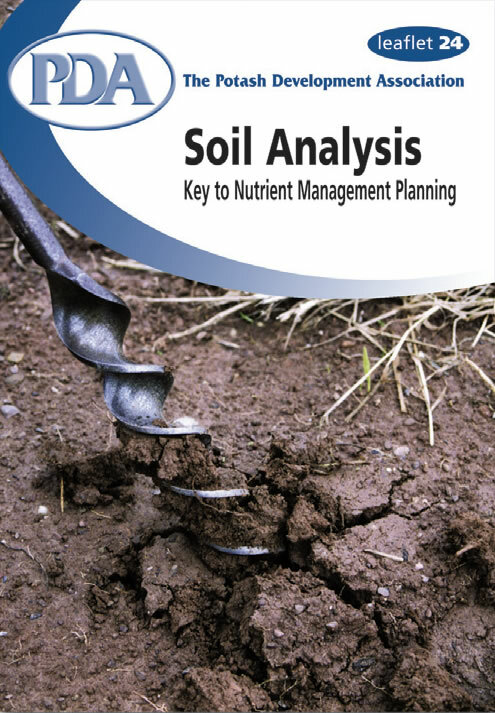 The potassium status of soil should be checked every 3 – 4 years by soil analysis. If soil is tested every 3 years in a 20 ha field, the annual cost is only around 13 pence/ha. This will provide a good basis for decisions on potash applications.The potash content of any manures or slurries applied should be taken into account. 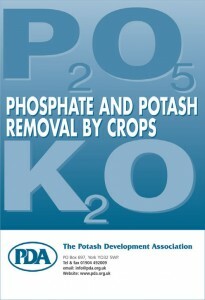 For potash and phosphate, annual nutrient balances are useful and easily calculated, at least for arable crops. There are standard values for potash removal per tonne by the main crops and these can be used with recorded yield to estimate removal (see PDA Phosphate and Potash removal by crops). The trend in potash balance (applications minus removals) over years will indicate if fertiliser use is meeting crop requirement. Finally, as for all fertilisers, make sure the spreader is properly maintained, calibrated and operated.